There was a discussion recently on Classic Rendezvous Bike list; the tread titled “Toe overlap even on good bikes,” implied that toe overlap was a design flaw and one should not expect to see this on quality bikes. Toe overlap is a result of other critical design factors and cannot always be avoided especially on smaller frames. When a framebuilder designs and builds a racing frame, his main criteria are to: (1.) Place the rider in a position where he can pedal with maximum efficiency, and (2.) Design the frame so the finished bike will handle at speed in the best way possible. If the result of the design is toe overlap then the builder can do little because to achieve toe clearance other aspects of the frame’s design would have to be altered. For example the picture above shows my own bike. It has a small 52 cm. (C to T) frame and has about an inch of toe overlap. If I were to make the front end of the bike one inch longer to avoid toe overlap, I would have to do one of the four following things or a combination of all four. (1.) I could make the seat angle steeper, or (2.) the top tube longer. (3.) I could make the head angle shallower, or (4.) the fork rake (offset) longer. The first two would effect my riding position; the last two would affect the handling of the bike. Toe overlap is not a problem because riding and cornering at normal speed the front wheel never turns far enough for the toe to hit the front wheel. The only time it becomes an issue is when turning sharply at a very slow speed; doing a U-turn on a very narrow road for example. Caution and common sense are all that is required when executing a tight U-turn. If you are turning left then your right pedal will be down for maximum ground clearance as you coast into the turn. By the time you need to start pedaling again you are already half way through the turn, and the right crank has to complete ¾ of a turn before the toe is opposite the front wheel. By that time, you should be all the way around and the front wheel is straight ahead again. If you are not the coast again, or ratchet the crank back again on the freewheel. Doing the same maneuver with a fixed gear is a little trickier; but it is a matter of timing. Go very slow and start to turn as the toe passes the front wheel; that way the crank has a whole revolution to go before it makes contact again. If the front wheel is still turned the next time round; straighten the front wheel so the toe clears, then turn sharply after it has passed. Fixed gear and fenders (Mudguards.) is going to make this move a little difficult, but not impossible. With clipless pedals, you could unclip the outside foot and move your toe back to give more clearance. I sometimes get out of the saddle and simply point my toe downwards to give more clearance. What you need to avoid is a situation where you get your toe on the wrong side of the wheel in a turn; if you do, try not to panic. Ratchet the crank back if you have a freewheel, or if you are riding fixed gear, keep going and let the toe pass the front wheel so you can straighten up again. Lastly, I would like to point out that a racing motorcycle with narrow swept down handlebars; turning is restricted because the handlebars touch the fuel tank. Here is a machine that will go 200 mph plus, and restricted turning seems not to be a problem. Therefore, I maintain the opinion that toe overlap on a bicycle is neither a design fault nor a problem. Most of my riding is in the Mission in San Francisco, which requires an emergency maneuver at low speeds about every other block, so I view toe overlap as a (literally) fatal flaw. I really appreciate this article. I just bought my first road bike (I am mountain biker to the core) but thought that riding with my wife (who is a budding road addict) was important. After our first ride together I was turning at slow speed into our driveway and my toe rubbed the front wheel - I panicked. Sweaty palms, eyes like a deer in the headlight, shaky knees - the whole bit! But I searched for an explanation, found this article and then rationalized that during our twenty one mile ride, toe overlap hadn't been a problem. Now that I am more aware of it I can anticipate and prepare. Thank You!!!! My overlap has never created any kind of safety issue. If one gets to know their bike well enough, they learn its limitations. I instinctively avoid placing the pedal in situations where the wheel might whack my foot. It just does not happen. I could wear white shoes for ten years and have no tire marks from it. Actually on a motorcycle, at speed, you 'turn', actually push, the steering in the opposite direction and precess around the bend, the most extreme example of this is speedway riding. A high performance racing motorcycle is an utter pig to turn around ala U turn. In fact it is impossible to complete the UK motorcycle test on a race replica motorcycle due to this very problem. For many couriers, fixies, and cyclocross riders like myself, toe overlap is a right royal pain. I've had a frame specially made to get around the problem, and I use small cranks to start with. Sorry, but 'toe overlap' is a problem caused by being cheap, and is part and parcel of this 'compact geometry' blather to minimise the number of frame sizes manufactured, and thereby save costs. I've been riding for over twenty years. I've had an expensive carbon racing frame for the past 7 years and have been aware of the toe overlap. Never had a problem with it until this year when twice I was executing a very slow turn and pedaling simultaneously. My cycling shoe rubbed my front wheel and rode it up until it wedged against the frame. Down I went hard and fast. So up until this past racing season I would have said it wasn't a problem. Now I am not so sure. Toe overlap is not so good for trackstanding. Traffic and sharp turns esp. uphill make toe overlap a big problem. You can't always time things the way you like if you're surrounded by cars. 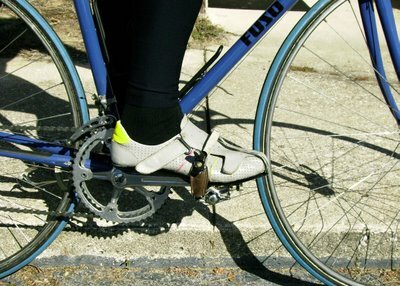 I am immensely amused by people worriedly commenting on the dangers of toe overlap on their BRAKELESS FIXED GEARS. Worried about toe overlap? How about brakes? I thought you guys liked making things more difficult on yourself. It should be more hip to ride bikes with toe overlap. City bike owners should modify old road bikes in order to create more dramatic toe overlap possibilities. I sense real marketing potential here. I never thought much about toe overlap. I used toe clips for years (without cleats, though). Then I switched to clipless, about a decade ago. My frame is an Italian stage racing type (but Canadian-made Marinoni). It's 49.5 cm centre-to-centre measured along a custom slack seat tube to accommodate long thighs (if the seat tube were a bit steeper, it would be 49 cm exactly). After I switched to clipless, no problem with toe overlap, until recently (2008), when I bought a new model of the same shoes. The sole is notably longer at the tip then my previous ones. Guess what? Now I have toe overlap, and because I do a lot of urban, high-density and slow-speed traffic riding, I don't like toe overlap at all. It does become a problem in that type of riding, on a daily basis. It's one thing to say you just have remain aware of the possibility of foot interfering with the front wheel, but it can be dangerous if you're not specifically keeping it in mind at all times when doing low speed turning. My frame is already typical of small Italian frames in the way it combines head tube angle with rake to achieve proper handling, and it's definitely a superb handler at speed and on fast descents. Once I get back to shoes that are shorter, I have no toe overlap, but frankly, I don't think handling is affected at all by the slacker head tube if everything else about the steering geometry is modified accordingly. But then, it's not a bike which is suitable for criterium racing. Good article Dave, I have always loved your bikes. My 57cm Bottecchia from the 80's has toe overlap and I love it. That bike is one of the sweatest bikes I have ever owned, and I have owned it for 20 years. 3 years ago I made it a fixed and still love it. I was a messenger in the 80's on a 753 Raleigh that had overlap and never had a problem, to all those that have a problem buy another bike, and quit whinning. I would have to do one of the four following things or a combination of all four. You dont seem to have considered using a smaller wheel! Unfortunately, toe overlap becomes a huge problem cycling alpine passes. I could not handle one in traffic. Test: yesterday, Passo dello Stelvio (when closed to motor traffic). It was horrible and wrecked my fun. I had to do righthand switchbacks all the way on the other lane with people descending to be evaded. Toe overlap is a problem, especially when you are racing a cyclocross bike on uphill steep switchbacks. Bike companies should inform consumers before we buy. Why build a cyclocross bike that you cant turn? I have tried all the toe up, toe down, back pedal, and on some courses all that just doesnt work! Having a bike I can pedal works! I am super disappointed in the company that we purchased our bike through. When I am racing I think of winning not where I have to place my foot! i have a wilier cento uno sl fantastic bike with a overlap toe,but i realized that my shoes are 44 and usualy my shoes are 43 or 9 to 9 1\2 so if i would get a smaller size shoe would that solve my problem. My Cannondale CAAD9 has as much toe overlap as in the picture shown above. Never even noticed it until I read this article. I don't disagree with those who say it is a problem; their riding habits or conditions may differ from mine. Toe overlap or not, as long as you know how to turn right, there would be no problem. Thanks for the tips Dave. currently riding a bareknuckle... and size L mks cages. (size 11 us). gives me approx 1.75" of overlap. once you get the coordination down to understand the harmony of your crank position relative to a turned front wheel it becomes second nature. sometimes you have to turn in segments if the radius of the turn causes the wheel to be at the angle where your foot can't avoid. so you straighten the wheel clear your cranks passed 0deg, and begin to finish your turn. thee only time i've found this a bit cumbersome is trying to navigate narrow walking paths say in a apt complex. having to turn left then right and back left again in a span of 11 feet @ 2mph can be challenging. I don't like toe overlap. You forgot to mention that if you lengthen the top tube, you can shorten the stem, so your position isn't compromised. In my case, I have a long upper body in proportion to my leg length. I would much prefer a longer top tube and shorter stem anyway. Also, I would never want toe overlap on a mountain bike. You obviosly didn't fully read the article; Lengthening the top tube and shortening the stem would compromise the handling. Don't you think I would have figured that one out if it were that simple. However, I do agree it would not be good to have toe overlap on a moutain bike, or a cyclo-cross bike for obvious reasons. I've had some toe clip overlap (minimal) on some of my bikes. My old steel Specialized Allez had it (and it was a long top tubed hours in the saddle bike) but it was never really a problem. I tended to be cautious in the turns, drop the opposite crank and not pedal through them anyway, so it was never an issue. I think it really comes down to an issue of knowing your bike and riding it appropriately for the circumstances.